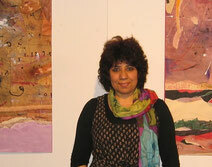 Born in 1956 in Baghdad (Iraq). School for art and graphics in Baghdad. Study of fine arts at the Academy of Arts in Baghdad. Member of the association of artists (BBK), Munich and Upper Bavaria. In Germany since 1998. Exhibits in Iraq, Germany, France, Cyprus, Jordan, England, USA, Russia, Switzerland. Acquisition of a painting by the British Museum. Symposia in Germany, Hungary, France and Czech Republic.